The number of calories you need every day depends on your age, gender, weight and activity level. Daily calorie needs range from 1,600 to 3,000 for adults, according to the U.S. Department of Health and Human Services. The daily value percentages for nutrients, such as carbohydrates, fat and protein, are based on a 2,000-calorie diet. 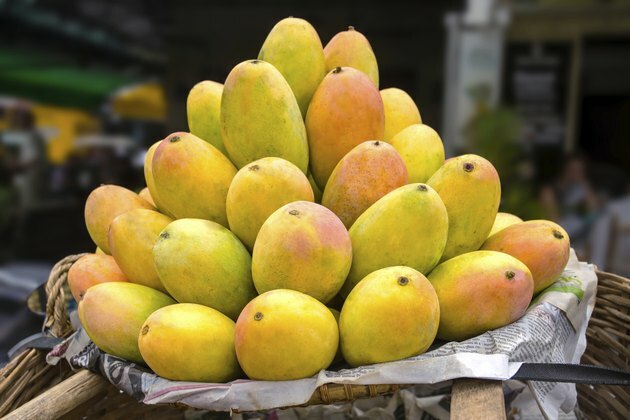 One mango without the peel provides about 200 calories, just 10 percent of the average daily calorie requirement for most adults. A 130-pound person can burn off that amount during an hour of moderate housework, according to the NutriStrategy website. This fleshy red and yellow tropical fruit, in addition to being virtually fat-free, is also an excellent source of vitamins A and C, and a good source of vitamin B-6 and potassium.